Captain and Lieutenant either side, Susan Sims and Brenda Hubbard back row, 5th and 6th from left. Anyone else recognise anybody? This page was added by Brenda Hall on 13/09/2012. The Lady on the left of the group looks like Miss Russell the head of Southdown Junior School. Can anyone confirm this ? Yes, now you mention it Terry, Captain was Miss Russell a Headmistress. Lieutenants name still escapes me but I know she used to live in Beresford Road, in no. 66, 68 or 70 & I think Miss Russell lived approx. opposite her. I only wish I could remember some of my fellow Guides names! Miss Russell then became Mrs Westgate. My headmistress at Southdown and later my first wife's Aunt (by marriage to Mr Westgate). I have a feeling Miss Russell may have lived at the corner of Denton Drive and Beresford Road. I met her again in the seventies when she stood in for my wife's head when he took a sabaticle at Brede School near Rye. She was living in Herstmonceux then. Great to see a picture of her, I didn't know she was in the Guide movement. Lieutenants name was Mrs Iris Oliver. Back row centre, me, to my left Susan Sims, then to my right Margaret Mitchell (Kings Ave), Catherine Eldridge (South Heighton farm), ?Margaret Wood?, Pat Cheese (Claremont Road) & Mrs. Oliver (see above). More later when my friend remembers them as sadly I can't! 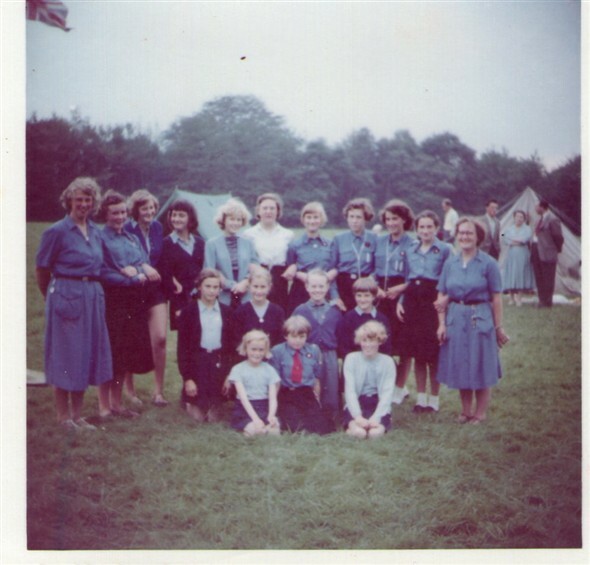 I think the assistant next to Miss Russell could be Edna Cole ( Fred Cole's wife), the guide 1st left middle row Betty Eldridge and the girl 1st right front row Brenda Parker (now Allvey, who is a well known member of Piltdown Golf Club). I think the guide to the right of Catherine Eldridge is Anthea Ellis (my wife) but she swears she never went to camp!